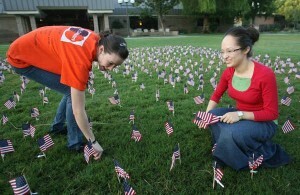 The American Principles Institute was founded as an official college club on the campus of Fresno Pacific University in the Fall of 2008 by students Preston Little and Jake Yeager. The club, known as the Sunbird Conservatives, was formed in response to the growing tide of liberal bias at FPU. Our mission was clear from the start: To educate as many people as possible with the message of conservatism. This meant standing up for and sharing the core principles of traditional values, individual freedom, free enterprise, limited government, personal responsibility, and the importance of a strong national defense. The Sunbird Conservatives club quickly earned a reputation of civility in the face of resistance from campus administration. During its very first days in 2008 it was suspended indefinitely by school administrators after a 9/11 Never Forget Memorial event. The Crime? Passing out Senator John McCain Bumper Stickers, among other conservative literature. The Provost of the University at the time publicly supported President Obama and interrupted school speech codes to shut down “Unbalanced” political speech from students. A month long legal debate ensued, leaving the first major event of the organization, “A Night Out with Victor Davis Hanson”, with no other choice but to be moved off campus to the Fresno Convention Center. In the end, after legal support from the FPU faculty, Young America’s Foundation, Alliance Defending Freedom, Foundation for Individual Rights in Education, and the Fresno County Republican Party; Fresno Pacific admitted it had violated the free speech rights of the club by censoring conservative ideas. They made this clear when they signed and sent an apology letter to the entire Fresno Pacific University Community. Since then, the Sunbird Conservatives Alumni Association has received widespread support from students, faculty, and administration at FPU, with the current President being an outspoken supporter of the current organization. The American Principles Institute has come a long way since its founding as a student club. In 2011, the club established an Alumni Association to ensure its presence on campus and in the community. Over the past seven years the organization has hosted seven consecutive conferences for the community. It has sponsored numerous student scholarships, seminars, trips to the Reagan Library, club retreats, on-campus debates, banquet dinners, and memorials to the victims of the 9/11 terrorist attacks. In 2013, the organization’s leadership started a long conversation with its supporters and launched the American Principles Institute— the educational arm of the Sunbird Conservatives. Formed with wide-spread support, API offered a vision of conservative policy solutions for valley issues, and started programs with the goal of expanding the conservative movement in the area. 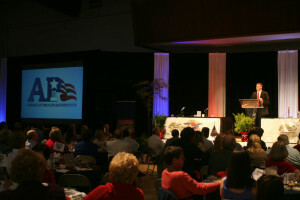 On April 3rd, 2015—the night of the 7th Annual Conference with presidential candidate, Dr. Ben Carson, as the Keynote Speaker—the Sunbird Conservatives completed the final step in its strategic plan towards establishing itself as a leading conservative organization in California by formally becoming the American Principles Institute. API is the Central Valley’s first conservative think-tank, comprised of individuals excited to teach conservative values across the state. As an official 501(c)(3) non-profit organization, its new mission is just as clear as the original: To educate Americans about conservative policies and principles through discussion, literature, and special events. With its clear mission, exciting programs, and broad support, API continues to be your best investment in the future of conservatism.